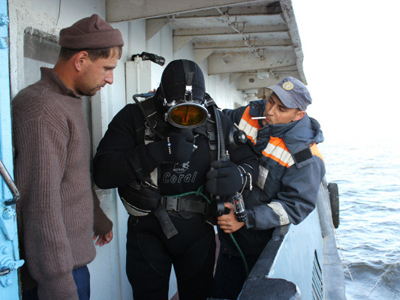 As divers conduct a final search of the sunken pleasure boat Bulgaria on Thursday, the fate of 16 missing persons is still unknown. 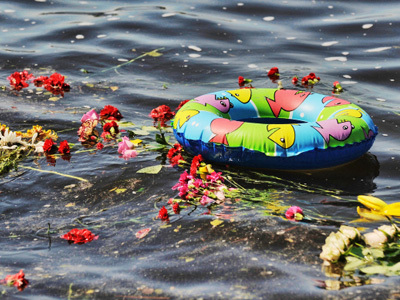 It is believed that 129 of the 208 people on board drowned, but only 113 bodies have been found. The latest nine have been found on Thursday, as the search operation continues. 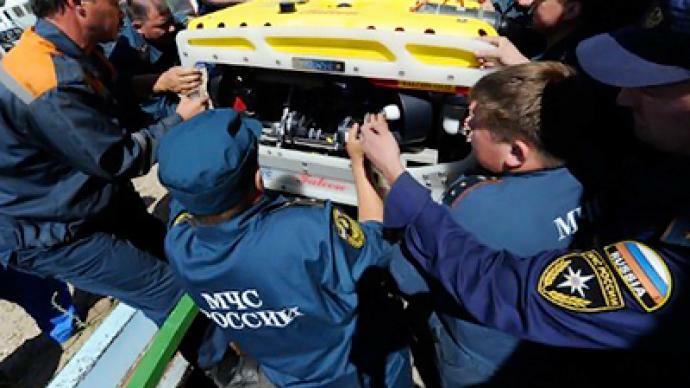 It is feared that the missing dead may have been carried away by the Volga River, which means they may be as far as 200 kilometer away from the wreck site by now. Some of the bodies recovered earlier were not inside the vessel. Another possibility is that some of the people were not on the ship at all. The organizer of the trip is suspected of faking the paperwork to boost profits, and it is not clear exactly how many people were on the Bulgaria. Meanwhile two people linked to the disaster have been arrested. They are Svetlana Inyakina, head of the firm which rented the Bulgaria, and Yakov Ivashov, chief expert of a branch of the river transport registrar, who allowed the use of the ship. Both are suspected of violations of safety regulations, resulting in numerous deaths. The offence may result in sentences of up to ten years in prison. Investigative committee also opened criminal cases against the captains of two cargo vessels which passed the sinking cruise ship, not stopping to help rescue people. However, Roman Lizalin, the captain of the motorboat Arabella, which was the first to stop at the scene, saving about 76 passengers and crewmembers of the Bulgaria, explained that the momentum of heavy cargo would not allow huge vessels to stop and join the rescue operation. “We were approaching the position of the tragedy almost at the same time as a heavy cargo ship. I don’t know why he didn’t stop – maybe he tried to, but the momentum of heavy cargo wouldn't let him. But as we approached the site, its presence could only have hampered the rescue operation. And I asked him to proceed not to waste time,” he told RT. It became evident that captain of the Bulgaria obtained validation to leave the port by deceit, as he under-declared tenfold the number of people aboard. Reporting to the traffic superintendent, he mentioned 20 people, whereas the actual number of passengers and crew exceeded 200. Some 20 of those were never registered anywhere at all, while the maximum passenger capacity of the vessel was only 140. The divers have found no traces of collision on the sunken ship’s starboard side, thus excluding an impact with another ship or submerged object as a reason for the wreckage, and exposing the overloading of the vessel as a major cause of the catastrophe. Some 200 rescue and recovery divers are involved in the search operation. The Emergencies Ministry says all parts of the sunken vessel will have been checked by midday Thursday, after which engineers will start preparing the raising of the Bulgaria. The plan is to use two floating cranes, which are to arrive at the site from the Moscow Region next week. Lifting the Bulgaria will be no easy task due to the soft riverbed and strong current in the area. Investigators expect that once the ship is afloat, they will find additional evidence in the criminal case over Russia’s worst waterway incident in decades. The ship allegedly was in terrible technical condition and safety rules were violated on it. 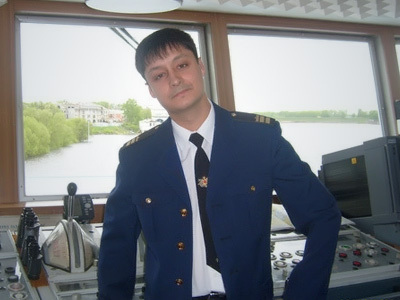 A former captain of theBulgaria told the media that his superiors in the company forced him and other crewmembers to man the ship despite its terrible condition, threatening to lay them off if they did not comply. Evgeny Minyaev says the owners saved money by not carrying out necessary maintenance of the vessel and that it should have been banned from sailing at least three years ago. Earlier, a radio officer from the Bulgaria who survived the wreck said he could not send a distress code when the ship started sinking. One of its diesel engines did not work at all and the whole electric system failed during the disaster. 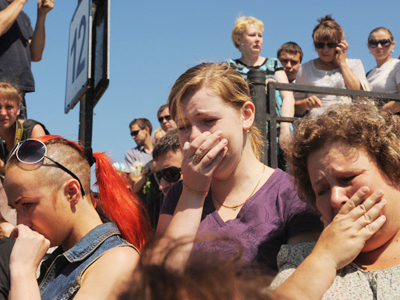 The Bulgaria sank on Sunday on its way to Kazan, the capital of the Republic of Tatarstan. The ship got into stormy weather, rolled on its starboard side and began to take on water. In a matter of several minutes it went underwater. Out of up to 209 people onboard, 79 survived, most of whom were rescued by the passing passenger ship Arabella. The Arabella’s captain says that it was really hard to distinguish in the dark water, people who were alive from the rubble that was floating around. “People were in a panic when we rescued them, in a state of shock, some suffering from other traumas. They were all covered in oil that was leaking from the sunken ship. It was a terrifying picture I have to say,” he said. 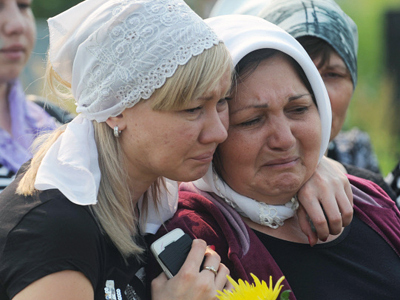 ­Russia's prime minister, Vladimir Putin has visited Kazan and paid tribute to the rescue operation and said that irresponsibility and greed are to blame for the tragedy. "So many victims, so many children were killed. It is terrible that we have to pay the price for the irresponsibility of disorder, for greed, for the gross violation of the rules of technical safety," Putin said during the meeting with members of the Government’s Investigation Commission. A special government commission was convened by President Medvedev’s order of July 11 to deal with the aftermath of the catastrophe. Putin also ordered an "all normative-legal framework” for the cruise business in Russia, to establish strict control of the observance of rules and to introduce strict punishment for their violation." He also ordered that compensation be paid to those who had lost their relatives and to those who were injured. "Of course, everything must be done to help people in this difficult situation so that they do not feel abandoned, and to help restore their health, and to help financially. There are many orphans still. We should think about their fate," said Putin.